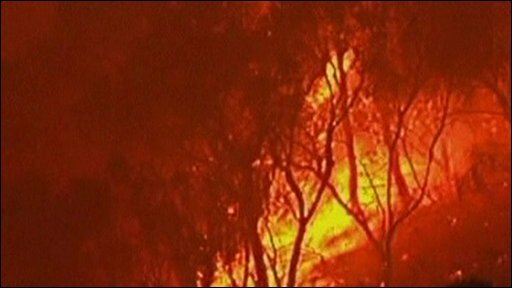 Nearly 40 homes have been razed in wildfires tearing through farming areas north of the Western Australian capital, Perth. State Premier Colin Barnett declared a natural disaster, freeing up emergency funds for those in need. The blazes have consumed about 13,400 hectares (33,000 acres) of land. Wildfires are common during the summer, and experts had warned that this year's fires could be particularly bad after one of the warmest winters on record. Some parts of the country have also been suffering from years of drought, making them more susceptible to fire damage. Two major blazes broke out on Tuesday afternoon local time in a wheat- and sheep-farming district, forcing the evacuation of Toodyay, a township, and threatening a second town, Badgingarra, further north. The state Fire and Emergency Services Authority (Fesa) said at least 37 houses had been destroyed. Fesa spokesman Allen Gale said: "The people directly affected by the fire, obviously, want to get back to their properties, but the area is very unsafe." 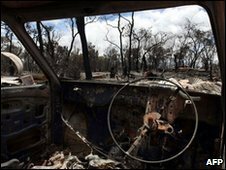 Many homes were destroyed in Toodyay, about 80 km (50 miles) north-east of Perth, where hundreds of firefighters were at work. Two firefighters were treated for smoke inhalation and a third was treated for a heat-related illness. Farmers also reported livestock dying. "It's a devastating fire with great destruction," the state premier told media. Cooler conditions and water-bombing helicopters were expected to control the fires on Wednesday. Investigators believe falling power lines sparked the Toodyay blaze, reported the West Australian newspaper. Australia is still recovering from "Black Saturday" in February, when 173 people died and more than 2,000 homes were lost in the state of Victoria in the country's worst natural disaster of modern times. In the aftermath of "Black Saturday", officials issued a new level of "catastrophic" fire warning. Parts of Western Australia were given this "catastrophic" rating earlier on Wednesday.